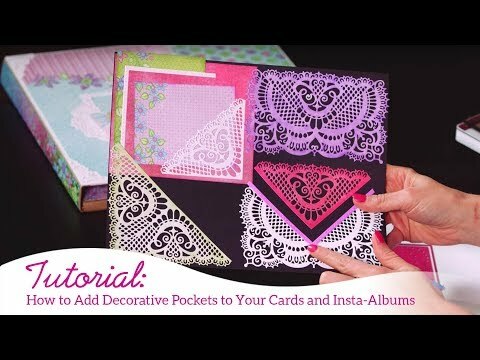 Instructions: Take your petite pockets die and diecut using white cardstock. Next take the gold mirror paper and diecut using only the mat piece from the die set. Now take your eyelet oval die and diecut the decorative frame using gold mirror paper. Once done take your white cardstock and diecut using the basics eyelet oval die set. Adhere the petite pockets accent die to the back side of your large eyelet oval diecut piece. Now take your white basics eyelet oval and add some foam tape to the back side for added height and affix on top of the large oval die piece. 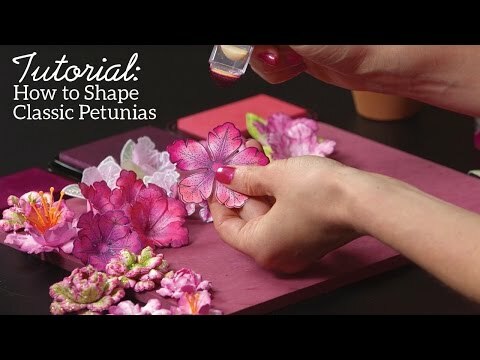 For your flowers, stamp and diecut your petunia using the wilted violet oxide ink. Stamp a total of 3 large and 3 small petunias. To shape, simply take your tweezers and twist each petal. Adhere to your card to complete the look and finally finish off your card by adding a sentiment from the Heartfelt Love paper collection.